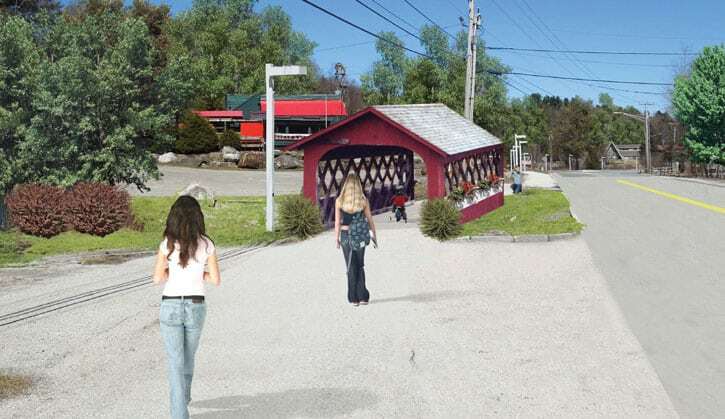 Artist’s rendering of the proposed covered bridge gives residents a picture of the plan. KILLINGTON — If all goes according to the plan, sometime this spring visitors to the area will have an opportunity to cross a covered bridge on Killington Road — on foot. The bridge will be a small replica of a classic Vermont covered bridge and will be built across from Dean Hill Road next to the former Casey’s Caboose Restaurant. Amy Morrison, the town’s events and marketing coordinator, said the idea came up a few years back. Morrison said the project would cost roughly $30,000, and be paid for by the Killington Pico Area Association’s Beautification Committee. As of Friday, Jan. 15, the project had been fully funded, she added. The KPAA, she wrote, has been active in raising funds. McGovern donated $5,000 toward the project, according to the minutes of an Oct. 19, 2015 meeting of the economic development and tourism commission. The completed bridge should be done before summer, Morrison said. There had been a potential snag: back in October, fire chief Gary Roth told the Mountain Times that there might be an issue with the bridge’s location. He said then the tower truck would not be able to leave the fire station’s garage. That, wrote Morrison, has been resolved. “We reached out to the fire department to ask them if it would be an issue, and they confirmed that it would not be,” she wrote. Attempts to reach Roth for further comment were unsuccessful.